This post has been sponsored by RITZ. All thoughts and opinions are my own. Looking for a fun entertaining idea? Grab a pack of RITZ and whip up these No Bake Chocolate Peanut Butter Pie RITZ Crackers! We absolutely love entertaining, and we look for reasons to invite friends over on the weekends. On any given weekend, you can find us on the back porch hanging out playing board games with friends and enjoying dinner on the grill. Yard games are often a requirement for these types of gatherings, too. Last year, I picked up two of those huge inflatable bumper balls. We use Cinco de Mayo as the first opportunity to host an outdoor party every year, and last year I invited my curling teammates and their families over. It didn’t take long before the guys were climbing into those inflatable balls and running all over the backyard…and, yes, occasionally bumping into one another. I don’t think I’ve laughed that hard in years! Ok, time to turn our attention to food. After all, food is one of the best parts about spring and summer parties, right? 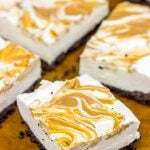 I’m a sucker for no bake pies during the warmer months. They’re both easy and delicious…that’s a win-win in my book! But the problem is serving pie at a backyard party isn’t always easy. 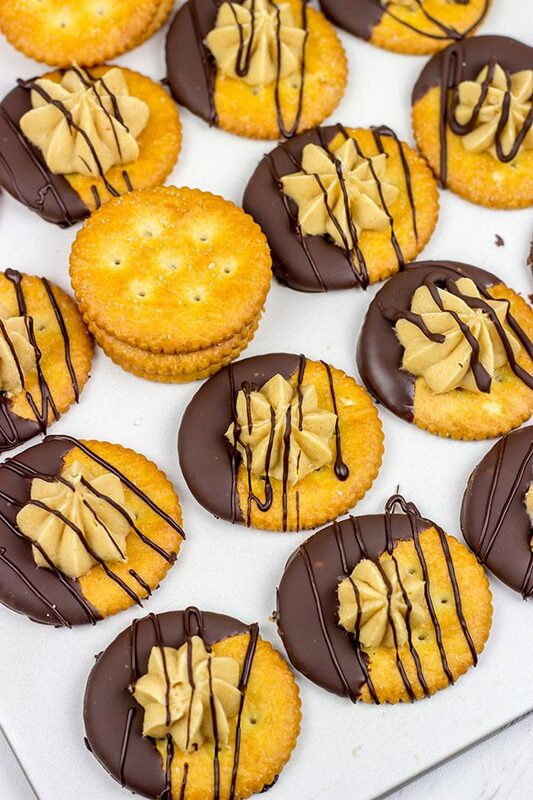 I decided to counter that problem with these No Bake Chocolate Peanut Butter Pie RITZ crackers. Robbie loves RITZ crackers. Every single meal starts off with him asking for crackers. 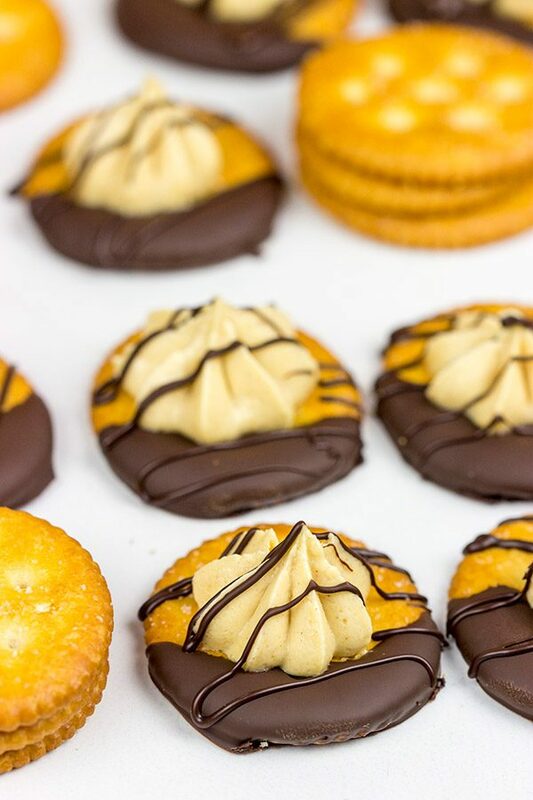 I stopped by our local ShopRite store the other day and grabbed a pack of RITZ Crackers in anticipation of making these No Bake Chocolate Peanut Butter Pie RITZ Crackers. The only problem is when I went to make this recipe, that pack of RITZ Crackers was gone. I’m pretty sure I know the culprit was a certain 2-year-old toddler. But no problem. Our ShopRite is located right next to the curling club, and I just swung by for another pack of RITZ before one of my games last week. And this time I bought 2 packs…one for me and one for Robbie! ShopRite has a great sale on RITZ crackers coming up, too! 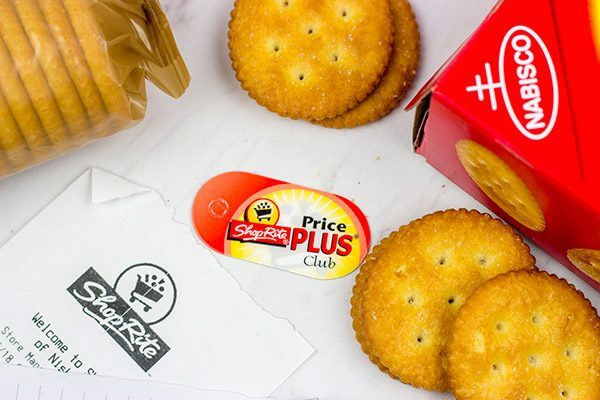 From April 22-28, when you buy 2 RITZ, you get 1 free RITZ Fresh Stacks with your Price Plus Card. 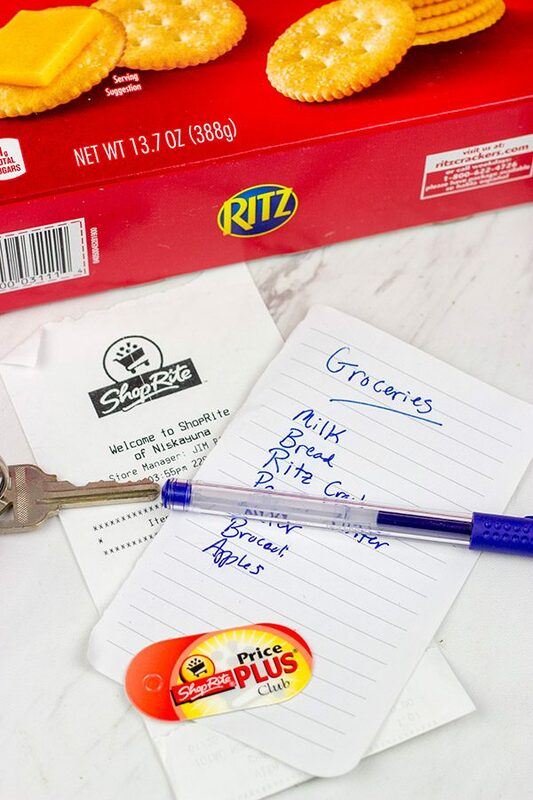 RITZ Fresh Stacks come in smaller, on-the-go packs, so they’re ideal for smaller gatherings. 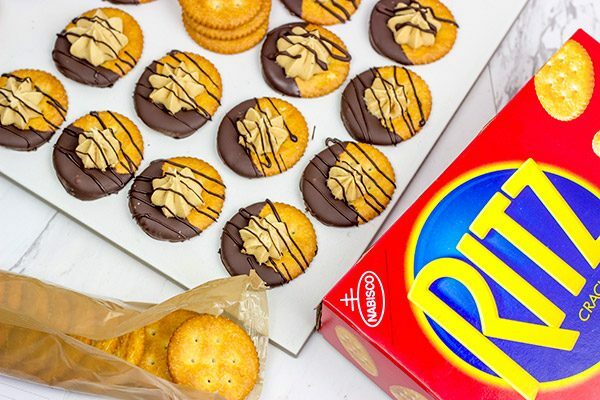 (This recipe for No Bake Chocolate Peanut Butter Pie RITZ Crackers can easily be halved for use with a pack of RITZ Fresh Stacks.) Click here for ShopRite’s store locator to find the nearest location to you! RITZ crackers are the perfect base for topping with all sorts of fun ingredients. 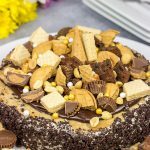 This No Bake Chocolate Peanut Butter Pie RITZ Crackers is a dessert version, but I found a recipe on SnackWorks for RITZ Pulled Pork Bites. 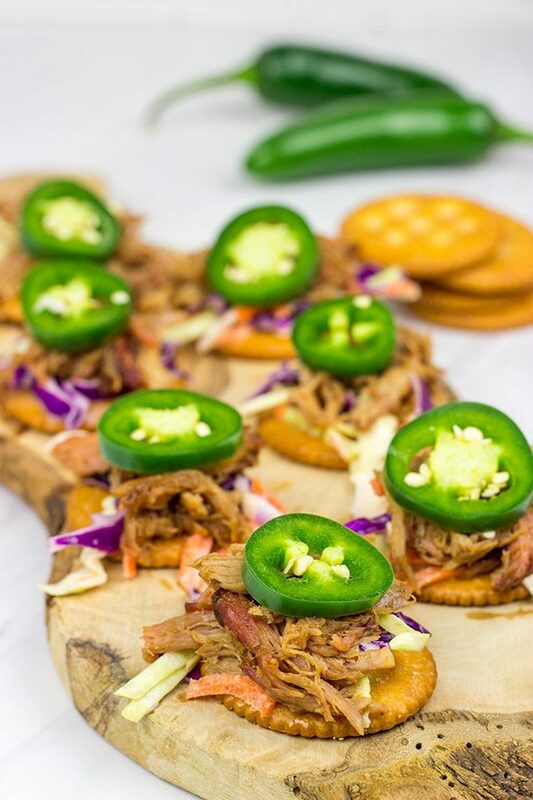 Pulled pork is a staple around our house, and I’m always looking for an excuse to serve pulled pork. 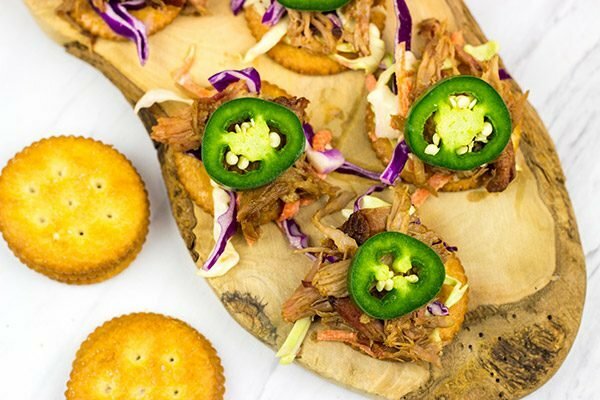 Topping a RITZ cracker with pulled pork and some homemade cole slaw was a really fun idea! In fact, I’m imaganing a party where you just put out RITZ crackers and a whole assortment of toppings. Pulled pork, hummus, tzatziki, chopped herbs, roasted chickpeas, peanuts, the list goes on and on…be creative! Then just let everyone build their own creations! Sounds like a fun way to kick off the warm weather party season, right? Cheers, friends! Over the years, we’ve picked up several entertaining hacks that make these evenings in the backyard much easier to plan. First: using a kiddie pool as a cooler. We have a small, inflatable kiddie pool that we actually use as a cooler. I stop by a local ice distributor before the party (he literally charges by the shovel-full of ice), and get enough ice to fill the kiddie pool. Then we lay all of the drinks in the pool so they’re nice and easy to see. We do put the pool in the shade so the ice doesn’t melt too quickly, but using a kiddie pool is a fun twist instead of lining up a bunch of coolers on the porch. On the topic of cold things, we often bring big mixing bowls out for cold dishes like potato and pasta salads. We don’t put the food directly in these bowls, but rather fill these bowls with ice and then put the actual serving bowl down in the ice. That keeps cold dishes cold. It’s always important to pay attention to food safety, and this little nested bowls trick has served us well over the years. Stacked cake stands. Do you ever have the problem where there’s too many dishes for the picnic table? We do. Until Laura realized that we could raid my stash of cake stands to create more space. We did this one year for a holiday party with crackers and various cheeses. Not only was it functional, but it looked really cool, too! Using cake stands as serving tools allows you to maximize the space on the table. And if you’re careful, you can even stack smaller cake stands on top of larger ones for a really fun layered look. Oh, and one more really useful tip we’ve picked up over the years is to keep disposable serveware on hand for a party. I’m not talking plastic spoons and forks, although those can still be handy. I mean actual serveware. We always ask friends to bring a side dish to share, and we end up with a whole assortment of salads and dips…and not enough serving spoons. Now we just keep a stash of large, disposable spoons in our party supplies bucket. Nice and easy! Place the semi-sweet chocolate in a medium heat-proof bowl and set over a pan of simmering water. Heat, stirring occasionally, until the chocolate has fully melted. Line sheetpan with wax or parchment paper; set aside. Using a medium bowl, stir cream cheese and powdered sugar together until smooth. Add peanut butter; stir until smooth. Add whipped topping; stir until smooth. Transfer mixture into a piping bag fitted with a large star tip. 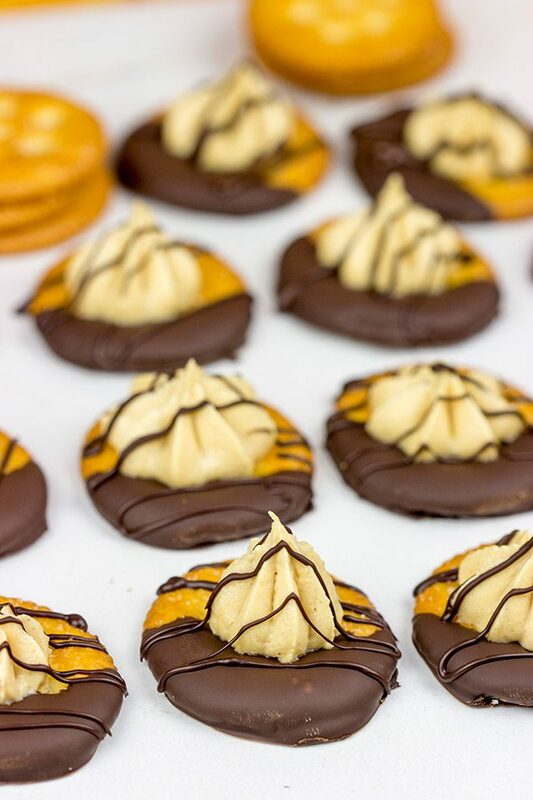 Pipe dollop of topping onto center of each chocolate-dipped RITZ cracker. Using the leftover melted chocolate from above, drizzle chocolate on top of each cracker. Umph, it was definitely very cold and very rainy here yesterday. Like 34°F (1°C) and pouring. At least it wasn’t a couple degrees colder as we would’ve had a heck of a snow storm on our hands! I remain convinced that Spring has to show up at some point soon! 🙂 I’m right there with ya on the Ritz crackers (and so is Robbie), so I had a fun time playing around with the toppings. So tasty! Hope your week is off to a wonderful start, Dawn! 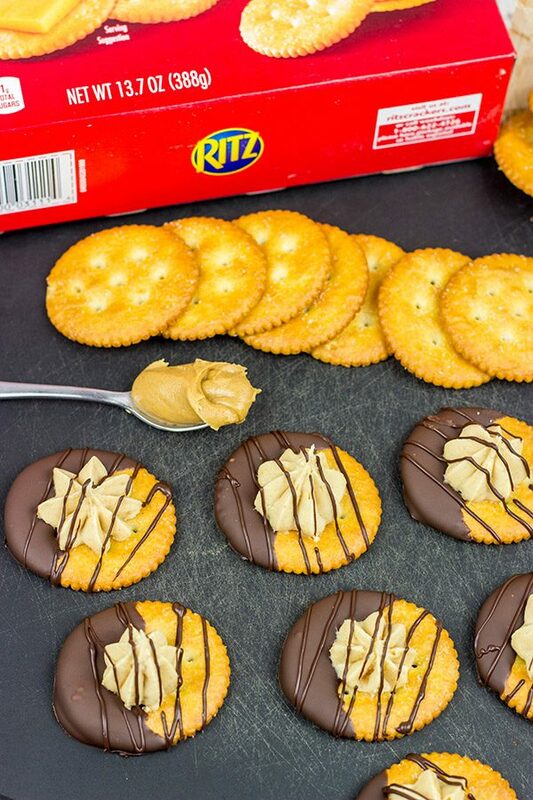 I literally picked up a box of Ritz yesterday so I could make chocolate-dipped pb crackers for a friend’s birthday; I only used half the box and was trying to think of something more exciting to do with the rest. And now I know! These sound SO GOOD! And I love your idea of using a kiddie pool for drinks, although that would be more of a fall or winter thing here because in summer the ice would melt almost instantaneously :). Have a great week, David! Yes! Further proof that we are long-lost siblings who were separated at birth. 🙂 There are so many fun ways to use Ritz crackers…although to be fair, most of ’em disappear before toppings ever arrive. I do highly recommend the chocolate-pb topping here, though! Also, the kiddie pool. I can see the problem with that trick out in your area. Maybe you could just put it out and then jump in when the ice melts? Haha! Hope your week is off to a great start, Kelsie! how cute are these! Love! I won’t be able to stop at one though! This weather does seem to keep going one step towards spring and two steps back towards winter! I hope the latest storm on the east hasn’t hit you again! What a fun treat these little pies are! Keep that warm weather coming! I probably say this every year, but I swear winter is lasting longer this year than ever before. I think we’ve stayed under our average temp for like a month now. Soon, though…soon. 🙂 So the latest storm managed to just be a lot of rain for us. Some local flooding, but nothing too crazy in the grand scheme of things. I’m ready for the sun, though! And I’m ready to get out in the backyard and hang out with friends again! Haha – I got a good chuckle over what is considered short-sleeve weather here! David, yesterday our highs didn’t ebb above 55 and you could spot the Northerners in this college town from a mile away – they were the ones hanging around bus stops in t shirts, shorts and sandals! Whaaaat?!?! Btw – I have a potluck tonight and these sure would be a hit! Love your drizzle on them and the piping – this looks fancy but is so easy – love eats and treats like that! Thankfully, we are back in the 70s today – hoping it’s almost as warm there too and hoping y’all are having a great week! Ritz crackers really are a great base for all sorts of fun ideas. You know me and my sweet tooth, so the chocolate-pb combo here was a big hit! And you’re right…so easy to make! Thanks so much, Shashi! Oh, and will you send some of that summer weather up our way please? We’re nearing about the same temperature as yourselves there David. 15 degrees is forecast here for tomorrow. A proper heatwave! I must have willed it on by what I wrote in my latest post. Ha ha. I love Ritz crackers and it’s a shame the deal they’ve got coming up there isn’t on here too or I would have grabbed myself some more! What a novelty way to enjoy them too, by dipping them into chocolate and then topping them off with a neat dollop of no-bake peanut butter on top! Love those Ritz combos too. You could practically make Ritz crackers go with anything couldn’t you? Hah! You really are reaching a heat wave over there in Scotland. It’s still cold here, but I think there is relief in sight…maybe! 🙂 Ritz crackers are a favorite in our house, and I always have to make sure to keep some in stock for Mr. Robbie. But they’re also a fun base for all sorts of party recipes, too. You know about me and my sweet tooth, so I immediately went to a chocolate-peanut butter topping. So tasty!! But, yes, I agree that Ritz crackers can go with just about anything. Thanks, Neil! It was snowing here in the UK less than a month ago, today its 19 degrees. Crazy weather! Although Im in no way complaining! Love how you are using Ritz crackers for these crazy delicious looking no bake peanut butter pie crackers – so good! Say what!? Now that is a wild temperature swing. Although, to be fair, our weather over here has been pretty insane lately, too. We just had freezing rain over the weekend. Freezing rain…in mid-April. I’m so ready for warm weather and outdoor party season! We love Ritz crackers in our house, so it was really fun using them as the base for this sweet treat. Thanks so much, Lucie!! Also, you’re already into short sleeve weather?! I’m glad things are looking up in New York, but can you send some warmer weather vibes over to Michigan? I haven’t had RITZ Crackers in years and now I want some. So happy you finally get to enjoy Spring weather. Food is defiantly the best part of spring and summer parties. 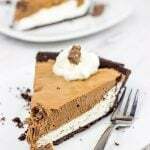 Your peanut butter topping looks divine. There’s my official statement: Robbie cannot be deemed guilty. Have you heard of the presumption of innocence, David? So I request to conduct a thorough investigation of those disappeared crackers. In order to assist you in the investigation, please ship ASAP a dozen of these “lazy”pies. Would you like to know how this might help? Unfortunately, I cannot reveal this yet (I haven’t figured it out). Just follow the instructions, sir! Thank you. Hahaha! Ok, just to appease you, I will conduct a thorough investigation of the missing Ritz crackers. But keep in mind that I will serve as the judge and jury of this investigation. I mean who else could be to blame for the missing crackers? Certainly not me! 🙂 Also, I’m totally laughing at you calling these “lazy pies.” Love it! Thanks so much, my friend. Thanks for the tips! How many drinks does a kiddie pool hold? Do these need to be store refrigerated? Curious how the peanut butter topping holds up!! Thanks! Can’t wait to try them! Hey Ruthie! Thanks so much for stopping by and leaving a comment. 🙂 If you’re planning on making these in advance, I would recommend making the filling and just keeping it refrigerated. Then just pipe the filling onto the crackers before serving. If you refrigerate the crackers, I suspect they might get soft. The topping itself holds up quite well in advance though! I hope this helps, and I hope you enjoy these!